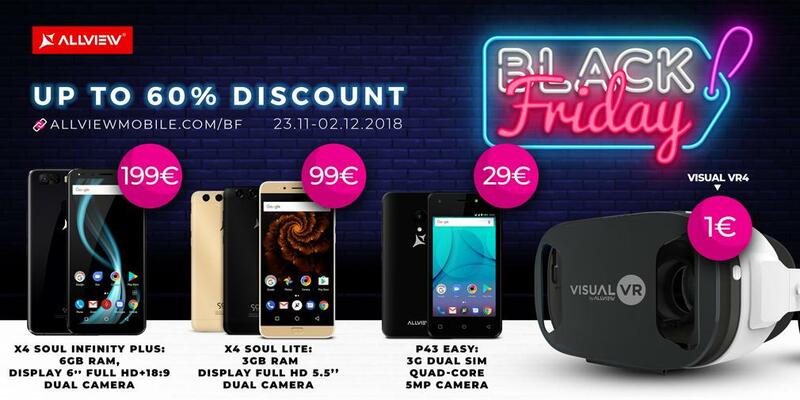 Two smartphones for the price of one for selected models, VR glasses for only 1€ and discounts of up to 60% for selected products are just some of the tempting propositions that Allview has prepared this year. A special selection of Allview’s bestselling smartphones are now available two for the price of one until 02.12, with limited stocks. P9 Energy Lite 2017, X4 Soul Mini 3GB, X4 Soul Infinity N or X3 Soul Style are some of the selected models included in the special buy 1, get 2 offer. Same deal applies for the AX501Q tablet and the AllFit smart band. X4 Soul Infinity Plus with 6GB RAM, 6’’Full HD+ 18:9 display with dual camera is available for 199€ only, while X4 Soul Lite with 3GB RAM, Full HD 5.5’ display and dual camera is now offered for just 99€ starting from 23.11. X4 Soul Xtreme packs a 4GB RAM, 4,550 mAh battery and a 20MP frontal camera, all for just 187€. Budget phones offer includes P43 Easy for 29€. The virtual reality is more affordable than ever! VR4 glasses with integrated headphones are available for 1€ only, with limited stocks.